After 15 years of creating entertaining and insightful tours, we continue to focus on giving you the best visit possible to the Vatican. Dark Rome is the Vatican tour operator with the highest partnership status possible. We have used our special position to partner with the Vatican and craft tours especially for you. Our unique status means that we can get you in faster and earlier than any other tour operator as well as the general public. Once inside, we take you to those exclusive areas that are usually off-limits to the public. Touring the Vatican is no ordinary experience, so don’t visit with an ordinary tour operator. Some tour operators have “Skip-the-Line” entry but this can still leave you waiting in line for up to an hour at busy times. As an official Partner, we are blessed with our own Private Partner Entrance which always gives you instant access. Our First Entry to the Vatican can get your tour in first. With us, you can enter the Vatican 30 minutes before other tour operators and over an hour before the public so you can enjoy the Sistine Chapel in relative peace. With our Vatican Partner status, you can see the Sistine by night, have breakfast as the sun rises in the Vatican Pinecone Courtyard or access areas which are off-limits to others like the Bramante Staircase. With our extensive range of tours, you can choose child-friendly routes, quiet strolls through the Museums at night and Sunday excursions from the Vatican to the Pope’s Summer residence. We are proud to provide a tour that suits your needs. We have more and better reviews than all other Tour Operators. 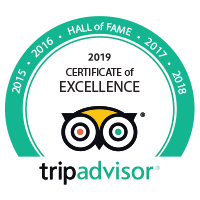 Our guides are art-historians, our tours cover the best of the collections, and our commitment to our guests creates insightful and memorable experiences. Take one of our Vatican tours and judge us for yourself.